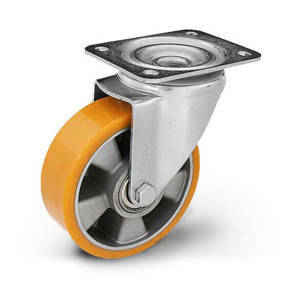 Casters for high loads with ALPU wheel, reinforced construction. Made of pressed steel sheet and equipped with Polyurethane tyre. For fixing the swivel head, a pressed steel sheet with a double ball bearing is used. 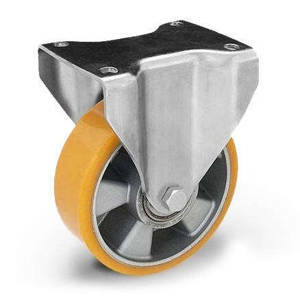 Reinforced KPH casters - reinforced fork made of pressed steel sheet zinc-plated with swivel head and double ball bearing. Cast iron wheel with Polyurethane tyre. KPWW casters with ZPU wheel for very high loads - fork made of pressed steel sheet welded and painted. Swivel head with longitudinal ball bearing and cone bearing. 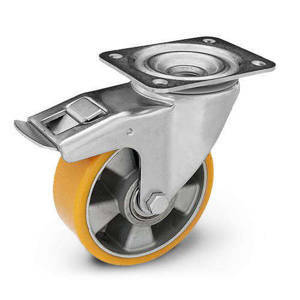 KPWD casters with twin ZPU wheel for very high loads - fork made of pressed steel sheet welded and painted. Cast iron wheel with Polyurethane tyre. Swivel head with longitudinal ball bearing and cone bearing.